We offer a wide selection of free patterns, for use in knitting our yarns. You can find our range of patterns here. CANTATA is Cascade Yarns® featured yarn of the month. 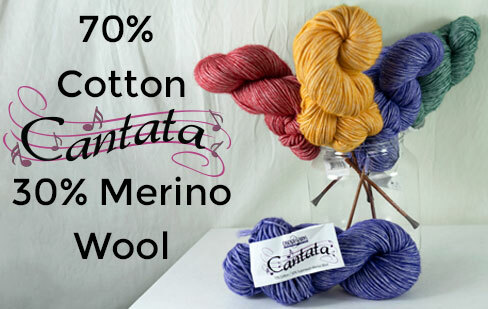 With the unique construction of a cotton tube with merino blown inside, Cantata is a versatile multi-season yarn with a great deal of loft and airiness. This worsted weight blend has a heathery look and is available in 14 fashion forward colors (with more coming for Fall 2019). Cantata has fabulous stitch defintion and works up beautifully in your favorite stitch. The free patterns supporting Cantata can be found here. What’s new at Cascade Yarns®? Find our in-stock new yarns here. Over a dozen new patterns available for Spring 2019. We have hundreds of free patterns from top designers! Find your next project here. Cascade Yarns® is featured in a number of books, such as the popular 60 quick knit series. A list of recent books using our yarns can be found here. Celebrate Local Yarn Store Day! Exclusive Mosaic Cowl designed by Shannon Dunbabin. Visit your local yarn store for the download code. Sign up here to get crochet and knitting tips, free patterns, contests with fun prizes and updates about Cascade Yarns®, delivered to your inbox. Receive the squares for the 2018 Gradient Lapghan by signing up for our Newsletter below! Join Cascade Yarns® next mystery knit-along using our 220 Superwash® Merino to knit the Knitterati Gradient Lapghan! Coming in March 2018! Check out the details:here. 30th Anniversary Knitterati Afghan Knit Along. For more details go: here.